The DC Environmental Network (DCEN) Sends Priority Budget Recommendations to DC Council Environment Committee. 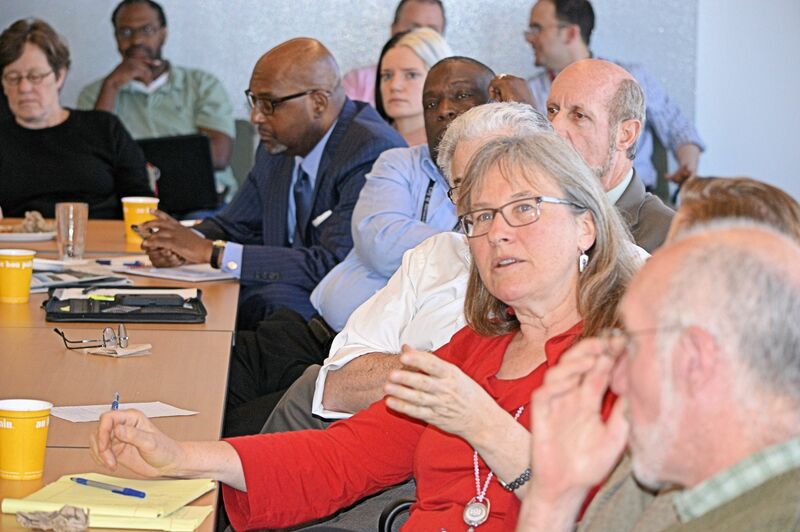 – The DC Environmental Network (DCEN), DC Fiscal Policy Institute (DCFPI), DC Department of Energy & Environment (DOEE), and DC Department of Public Works (DPW), held joint budget briefings to prepare for DC Council hearings. 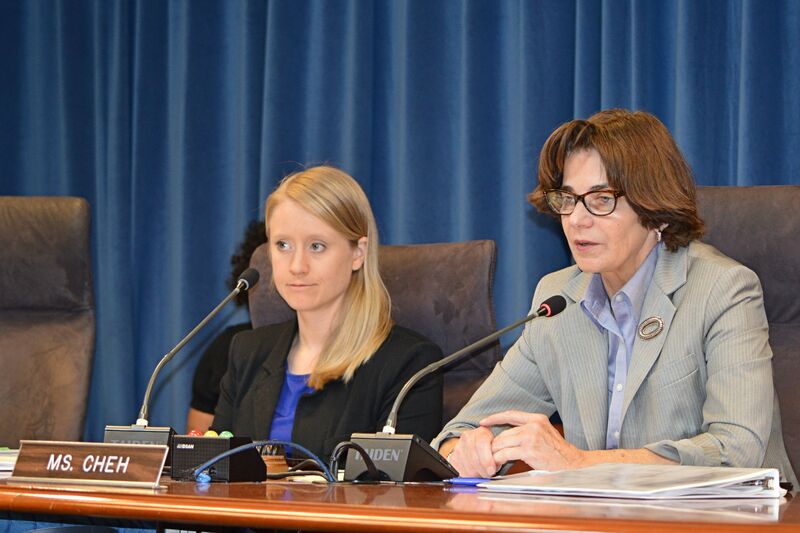 – The DC Environmental Network participated in both the DC Department of Energy & Environment (DOEE), and, DC Department of Public Works (DPW), Budget Oversight Hearings! 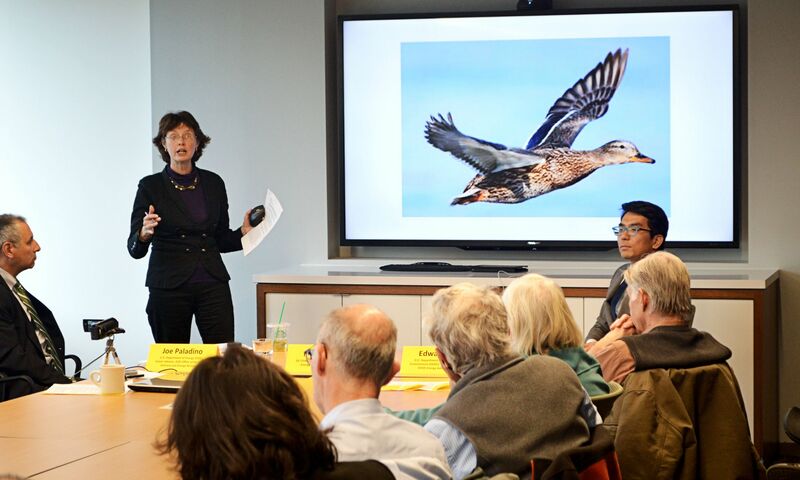 At these events, DCEN expressed support for funding important poverty, wildlife, recycling, and climate programs that the two agencies play an important role in. 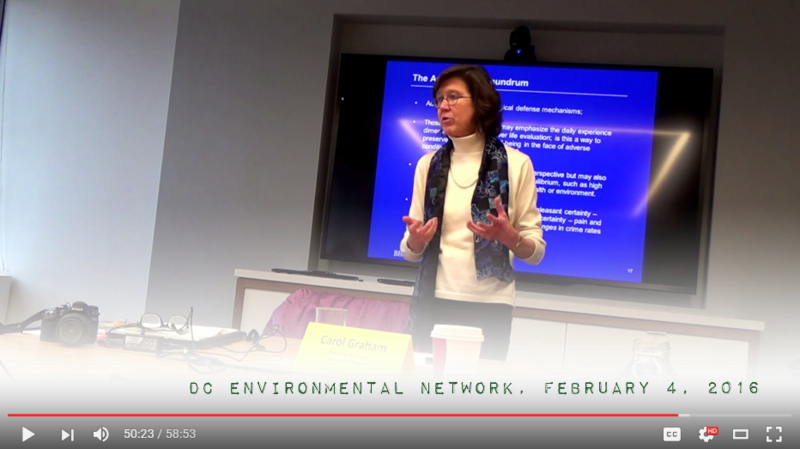 − DCEN TESTIMONY: Council of the District of Columbia, Committee on Transportation & the Environment, Budget Oversight Hearing: District Department of Energy and Environment (DOEE), April 12, 2016, CLICK HERE! 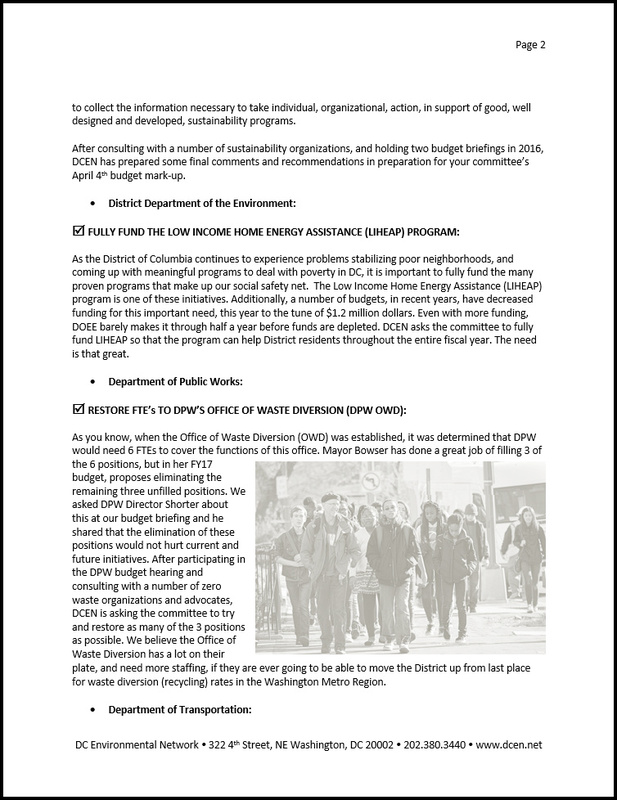 – DCEN TESTIMONY: Council of the District of Columbia, Committee on Transportation & the Environment, Budget Oversight Hearing: District Department of Public Works (DPW), April 14, 2016, CLICK HERE! Zero Waste , Pay As You Throw, Training Video! 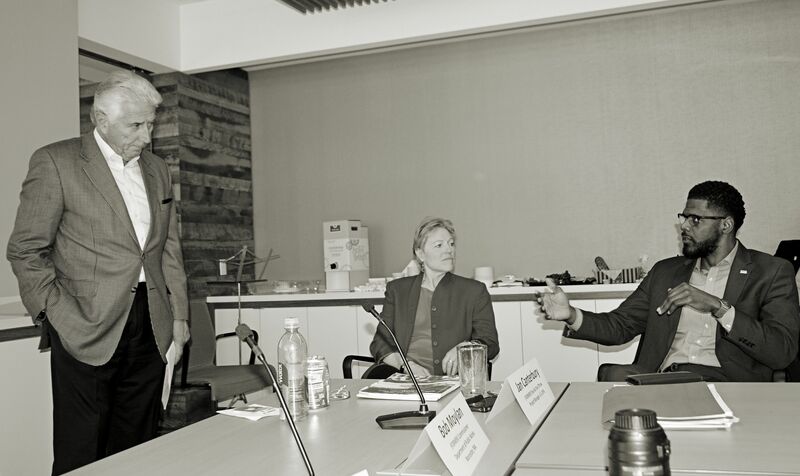 On April 13th, the DC Environmental Network, spearheaded by Global Green USA, organized a Zero Waste training on Pay As You Throw (PAYT), a usage pricing model for disposing of municipal solid waste, that could help District ratepayers save money, reduce green-house gas emissions, and increase DC per capita recycling rates. This special training was co-sponsored by Green Cross International and the Zero Waste Committee of the Sierra Club, Washington, DC Chapter. Participants included representatives from the DC Department of Public Works (DPW, Office of Waste Diversion), DC Department of Energy & Environment (DOEE), Council of the District of Columbia, City of Alexandria, National Recycling Coalition, Institute for Local Self Reliance, Alice Ferguson Foundation, Just Economics LLC, Community Research (Zero Waste PG), Northstar Sierra Club, Optoro, Building Materials Reuse Association, Energy Justice Network, Sierra Club (DC & Prince Georges County Chapters), Green Cross International, DC Environmental Network (Global Green USA), and other zero waste advocates. We greatly appreciated DPW Director Chris Shorter, and Annie White, Manager of the Office of Waste Diversion, for participating in the entire four-hour program. ► Watch Jan’s Presentation Here! ► Watch Bob’s Presentation Here! ► Watch Kristen’s Presentation Here! The initial feedback for this training was very positive. We believe the District has the potential to make great strides towards becoming a zero waste city. Contact DCEN if you want to join our zero waste campaign to make the District the highest, per capita, recycler in the region. 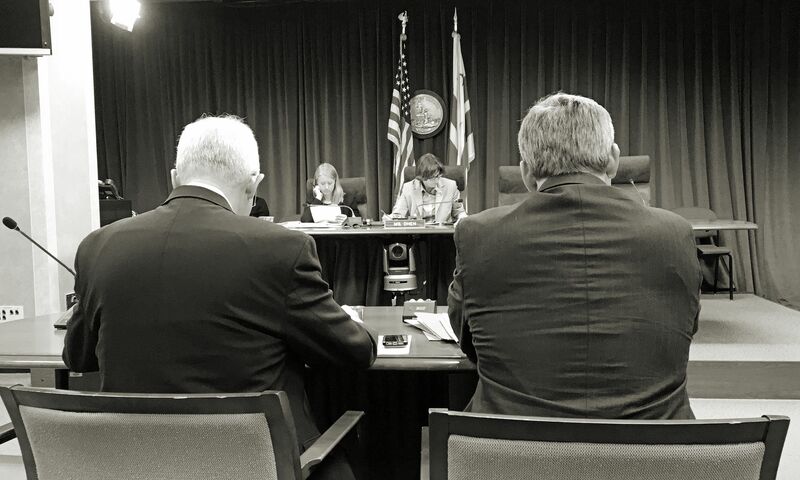 DCEN Participates in DC Council Committee, DOEE & DPW, Budget Hearings! The DC Environmental Network participated in both the DC Department of Energy & Environment (DOEE), and, DC Department of Public Works (DPW), Budget Oversight Hearings! 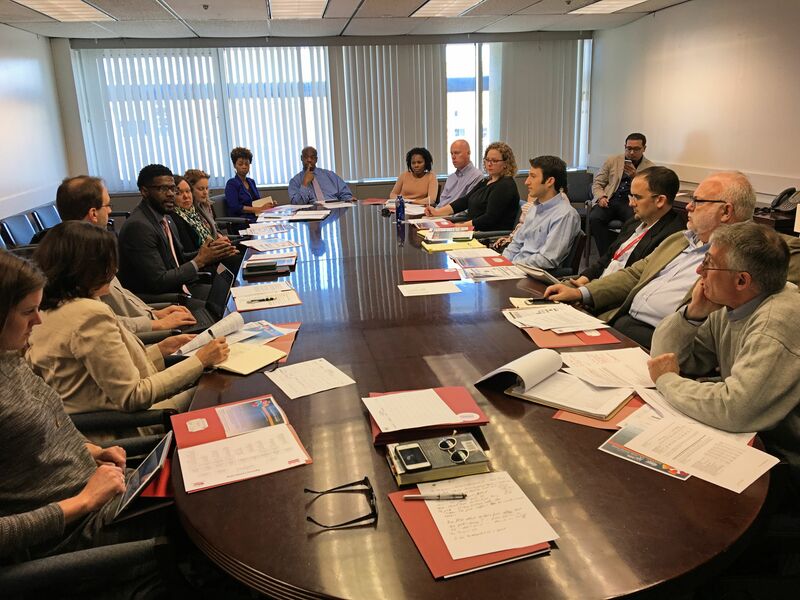 The DC Environmental Network (DCEN), DC Fiscal Policy Institute (DCFPI), DC Department of Energy & Environment (DOEE), and DC Department of Public Works (DPW), held joint budget briefings to prepare for these two hearings. DCEN expressed support for funding important poverty, wildlife, recycling, and climate programs that the two agencies play an important role in. ► Council of the District of Columbia, Committee on Transportation & the Environment, Budget Oversight Hearing: District Department of Energy and Environment (DOEE), April 12, 2016, CLICK HERE! ► Council of the District of Columbia, Committee on Transportation & the Environment, Budget Oversight Hearing: District Department of Public Works (DPW), April 14, 2016, CLICK HERE! 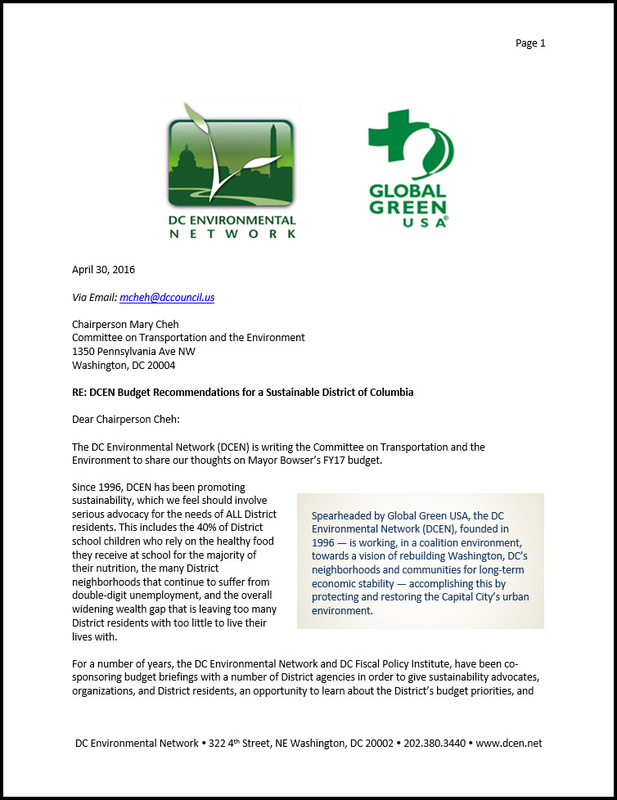 With the information we collected at the budget briefings and hearings, we will be sending out a final budget letter to the DC Council Committee on Transportation & the Environment, with our final recommendations, later this week. DCEN Well-Being (Happiness) Index Briefing Video! This briefing was given by the very talented Brookings Institution economist, Carol Graham, who is the Leo Pasvolsky Senior Fellow in Global Economy and Development, at the Brookings Institution, & Professor at the University of Maryland’s School of Public Policy. ► Watch Carol’s Presentation Here! This was the first salvo of a new DCEN initiative to follow in the footsteps of the City of Santa Monica, and develop our very own well-being index project in the District of Columbia. We will be sponsoring a number of summer webinars on this topic for anyone interested in learning more about what this could mean to economics and public policy in the District and surrounding region. Come join our campaign! DCEN’s May Networking Event is Coming Soon! Come Meet the Organizations and People Who Are Leading Education and Advocacy Efforts to Protect Our Rivers in the Washington Metro Region! On May 5th at Noon, join the DC Environmental Network, and some of the most active river advocacy organizations in the region, as they share highlights, through pictures and words, of their current work and their vision for how District rivers and creeks will be a more central component in all of our lives looking forward. This conversation will occur at the NEW offices of Friends of the Earth & Green Cross International, 1101 15th Street NW, 11th Floor. RSVP HERE. You must RSVP here to participate in this clean river conversation. Hope to see you on May 5th. DC Clean River Leaders Networking Event! Join DCEN, and Some of the Organizations and People Who Are Leading Education and Advocacy Efforts to Protect Our Rivers, for our Monthly Networking Opportunity. The health of the Anacostia River, Potomac River and Rock Creek, and the quality of our lives, and sustainability of our economy, are intimately connected. There are a number of DC based organizations that have passionately led local and regional efforts to represent the interests of our rivers, its wildlife, and the people who live near its banks. These groups have been actively working on clean water issues long before government and corporations decided that river restoration was good for voters and for business. 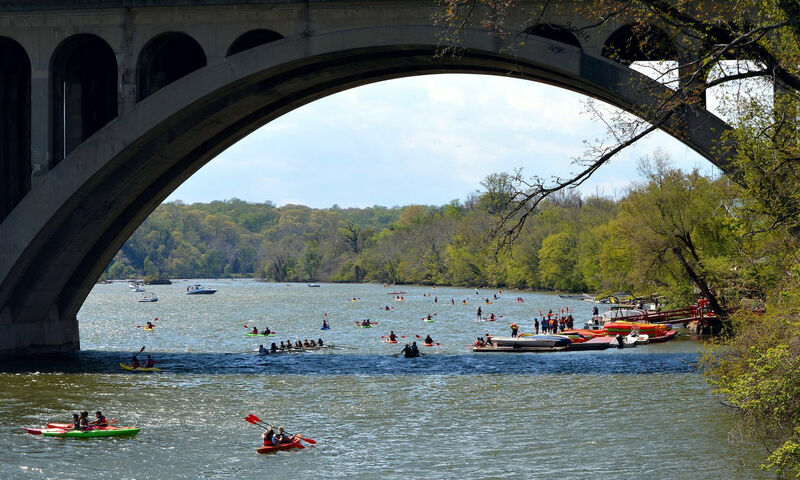 On May 5th at Noon, join the DC Environmental Network, and five of the most active river advocacy organizations in the region, as they give participants highlights, through pictures and words, of their current work and vision for the future. You must RSVP here to attend. This conversation will be held at the NEW offices of Friends of the Earth & Green Cross International, 1101 15th Street NW, 11th Floor. 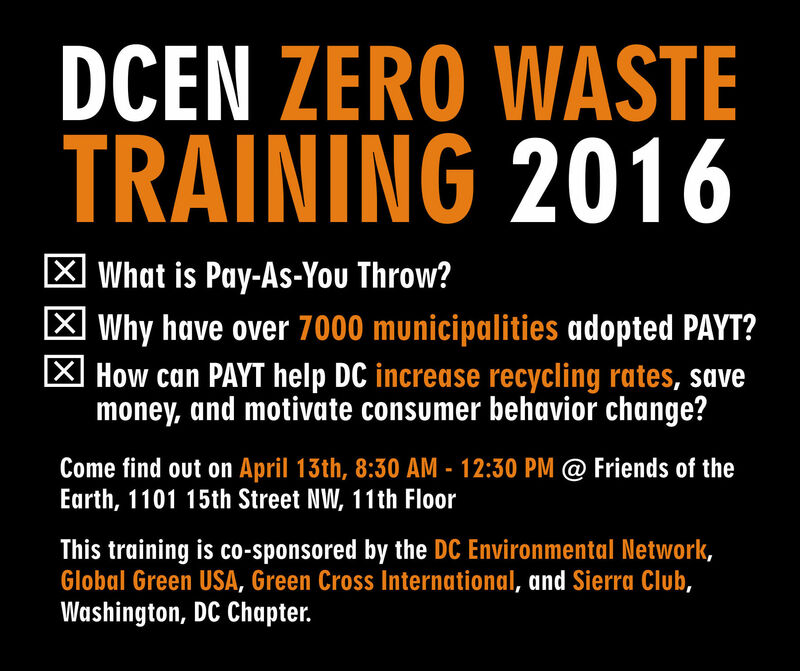 On April 13th, 8:30 AM – 12:30 PM, join the DC Environmental Network, Green Cross International, Global Green USA, and Sierra Club, Washington, DC Chapter for a special training on Pay-As-You-Throw (PAYT). This event will be held at the offices of Friends of the Earth and Green Cross International, 1101 15th Street NW, 11th Floor. – Jan Canterbury, Former US EPA PAYT Project Manager. Jan will present on “PAYT and the Climate Waste Connection.” As someone who played a large role in helping the PAYT movement, resulting in over 7000 municipalities adopting PAYT, she will share some large picture perspectives to participants. This will be followed by a question and comment opportunity. – Bob Moylan, Former Commissioner of the Worcester, MA, Department of Public Works. Bob will present on the “Successful Implementation of PAYT in Worcester, MA.” He will share hands-on details about how he led efforts to design Worcester’s PAYT program, designed and implemented a messaging campaign, and developed workable enforcement guidelines. – Kristen Brown, Vice-President Municipal Partnerships, Waste Zero. Kristen will present on “How Might We Design PAYT in the District?” Kristen has helped numerous municipalities design and implement PAYT programs that make sense. 12:00 – 12:30 Final Comments, Networking, and end of training. “Pay as you throw (PAYT) (also called trash metering, unit pricing, variable rate pricing, or user-pay) is a usage-pricing model for disposing of municipal solid waste. Users are charged a rate based on how much waste they present for collection to the municipality or local authority. DOEE Public Briefing on DC FY2017 Budget! On Monday, April 4th, at 5:30 PM, the DC Environmental Network (DCEN), DC Fiscal Policy Institute (DCFPI), and District Department of Energy & Environment (DOEE), will be holding a special briefing on DOEE’s FY2017 (agency) Budget. This briefing will be held at DOEE’s offices. RSVP here to attend this important budget briefing. This is a special opportunity for sustainability advocates and others, to learn about DOEE’s funding priorities, and other associated budget issues. 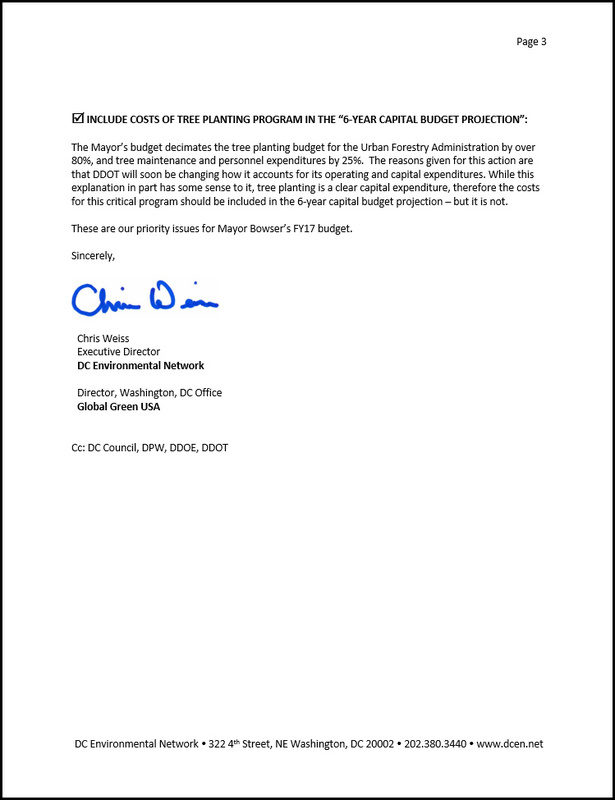 Soon after, on April 12th, the DC Council will hold a hearing on Mayor Bowser’s proposed DOEE (agency) budget. This is a great advocacy opportunity to testify on elements of the budget you like or do not like, and things that are not included at all. In 1998, the DC Environmental Network established the goal, in its 1998 environmental agenda, of creating an agency to focus on the key environmental issues of our time. After the passage of the “District Department of the Environment Establishment Act of 2005,” the agency officially came into being in February of 2006. More than any other agency, the District Department of Energy and the Environment’s activities intersect with much of the agenda of the District’s sustainability community. Making sure that Mayor Bowser’s proposed budget for DOEE supports important sustainability goals is key to making the District an environmental leader. DCEN encourages all interested organizations and individuals, to participate as much as possible, in the District’s budget process, and hope to see you at this budget briefing. 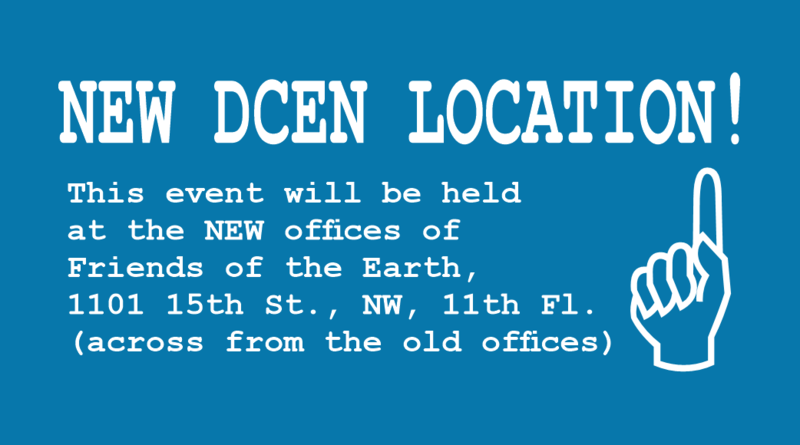 If you have any questions, contact the DC Environmental Network at 202-380-3440 or cweiss@dcen.net.